So again it seems like these posts start with an apology - the Internet is still down, and this little blogger is not impressed having to source a way to get on and talk about Lost stuff. It's a shame that one can't so much blog with the stuff when it comes to an Internet experience. Business should resume next week, and thanks to the commenters so far not busting my chops for the radio silence - loving that we have some understanding folk who'll give benefit of the doubtiness. We find a nice sixth poster which at first looks a little lame, but on reading the description about gloss and the rest of the statue only visible in certain light and angles makes our interest peck up. 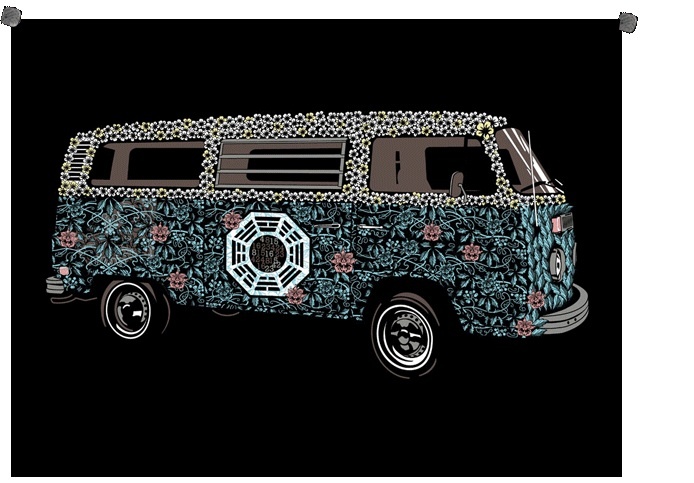 A decent Oceanic 815 or Locke chair edition to the set, or another Hydra cage or DHARMA van?? Apologies for the lateness, as someone mentioned in comments. This blogger has just moved house yesterday and has no Internet, so you can forgive me for being a little behind (shakes fist!). Anyways, currently using Internet cafe technology, thereby showing immense commitment... but let's get clueing! Check back to this post for clue updates. Update 1 - The star now has a pink cross over it. Still awaiting a sound theory as of yet... perhaps TPTB took on a previous comment of mine that the previous clues were too easy. Either way, I like being able to research online, even when I have as-of-yet no idea of the answer! Update 2 - Again sorry for a delay in updating. DCPB now has a seat layout, and a guitar. LostARGs have the answer - the pink cross is a hint to Blink 182, while the guitar belongs to a member of Fallout Boy. Both are on at the Superpages.com center in Dallas on Sept 23rd... sounds about right! 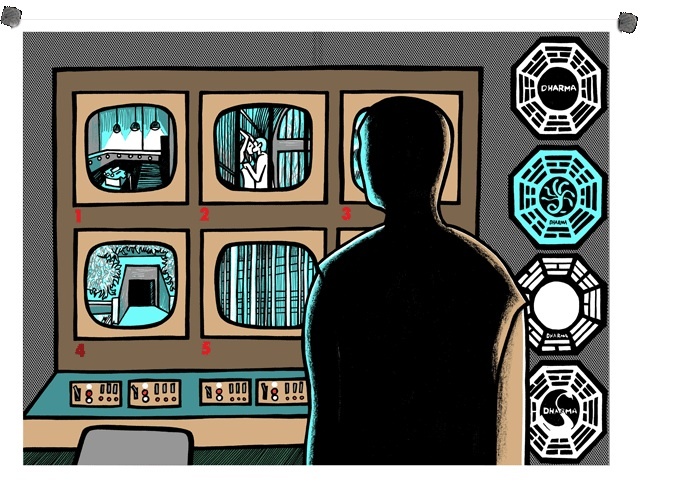 The poster features Jack looking at Kate and Sawyer on the Hydra station monitor. Thanks to Brian for the heads up. The Uni bookstore gave out bookmarks with the URL on. Get on over there and order soon to avoid disappointment. As far as the poster itself goes... it's a grower for me. I loved number 4, and the art on this one at first just doesn't seem to match - but I'm starting to like it the more I look at it. Let us know what you think. If you read the comments for the last post, you'll know I held off before doing a post cause I wanted all the details together. In future, we're going to just update posts with additional clues as otherwise we just have way too many for one frame. So subscribe to us so you know, or follow us on Twitter for updates. Anyway, let's recap Frame 5. The first clue was simply an image, quickly found to be the University of Arizona bookstore. Clue 2 appeared not long after showing the words Bear Down. Google this with Arizona and you find it is the official motto of the University. Clue 3 appeared not long ago too, saying "Wildcat Readers, see you on - J. Perkins/R. Morrison". If you check out the Arizona Wildcats football team website, you find these two players are no#9 and no#14 respectively, which links in with the final reveal that the frame will be available on September 14th. 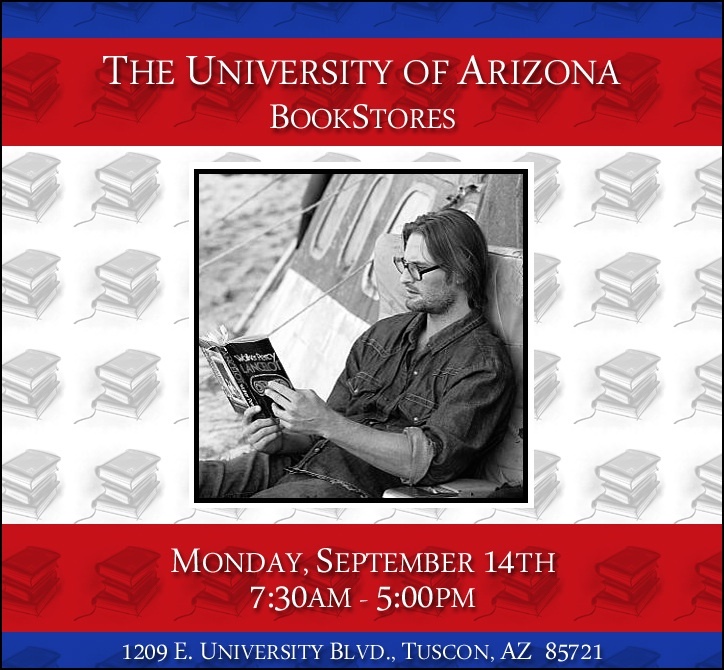 DCPB now shows the truth - go to the University of Arizona bookstores on this day between 7:30am and 5:00pm for the new URL. The address is 1209 E. University BLVD, Tuscon, AZ 85721. Arizona Lost fans, your fanbase needs you! Thinking we should just code all these hints now Biblical style - so this one is 5:1. DCPB has updated with an image of a bookstore. Quick on the heels of mystery, folk over at DarkUFO quickly recognized it as the University of Arizona bookstore. Sure enough, if you check out the bookstore website then you'll find a corresponding image in the slideshow. 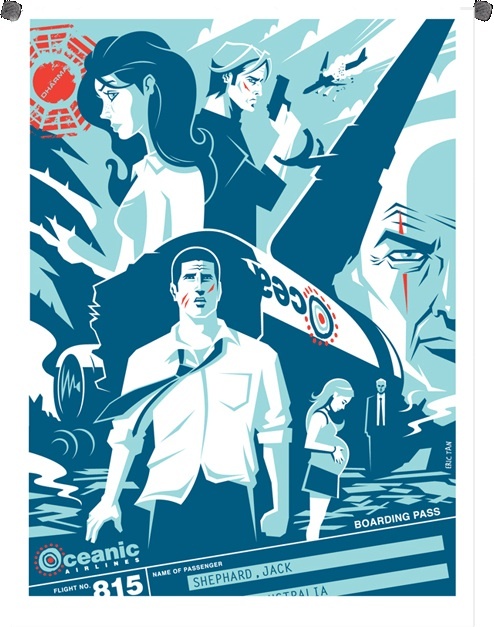 Looking at the frame, it truly is my favorite so far - a beautiful design by Eric Tan that focuses on Jack. The color is great too, and the likenesses are brilliant. It's the first one for me where I can imagine having it on my wall... and I'm very tempted to get it. Hmm. So maybe I'm biased, but I think this one will sell out fast! It goes on sale around midday PST. Be ready peeps! **Important Update** - The time has been changed to midday EST!! So don't get caught out, dear Lost fans!!! 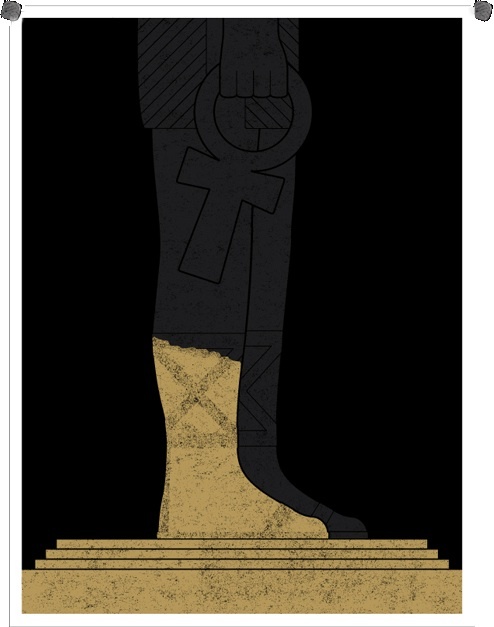 Update 2 - Frame 4 sold out in just over an hour after release - looks like my prediction was quite right - definitely the most popular poster so far. Apparently so - MOTU Pt 3 has been released on Hulu a day early, and DocArzt has the scoop. There's even a YouTube upload for those of us outside the USA and Canada! I have to say I'm a little bit disappointed. I was hoping for something a little more in the way of revelations from Mysteries Of The Universe, but we're now past Part 3 and there still doesn't appear to be anything we don't really know already. Damon Lindelof said we'd learn new things about DHARMA when asked at Comic Con... but so far I'm not seeing any OMG worthy moments. What do you guys think? It seems like all we post at the moment is minor hints. Anywayz, here's clue 3 for frame 4. With us? Good. A big thanks to '1st time caller' for the info. The image on DCPB matches an image on crumbs.com - confirming that this is the place where frame 4's URL will be. But at which store? New York? California? Or at all of them?! DCPB has a new hint for Frame 4. 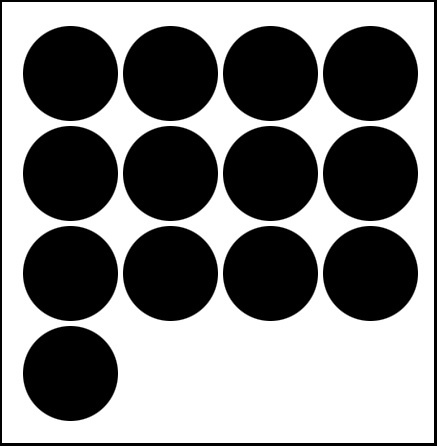 The 13 black circles form a P-like shape, though I like commenter Catie's opinion that the 13th circle shouldn't be there, as though the other 12 are part of something and the 13th messes with it. So where does that get you - a baker's dozen... fitting in with the previous Crumbs bakery theory. So looks like some fans will be gracing a bakery? Buy me one of those cupcakes, anybody? Well the dust has settled from Frame 3, and now it appears we have crumbs for Frame 4. DCPB has updated with a pic of the words "Wall Street / Larchmont" in a sort of normal font with pixels and specks falling off it. A quick Google search got me the lame theory of the Larchmont Hotel in New York, but a far better idea is on LostARGs where there's a bake shop company called Crumbs that has shops in Larchmont, California and on Wall Street, New York. Clue or not, I'm enjoying looking at the pictures of some buff cupcakes. We'll see how things develop, and keep a look out for more clues.